Los Ramos apartments are in front of the San Cristobal Beach in Almu��car, located in the Costa del Sol. The accommodation, which is beautifully decorated and fully equipped, consists of two double bedrooms, two bathrooms, a big lounge (the lounge and one bedroom have outstanding views of the sea, twin beds are available for one of the bedrooms) and dining area with satellite TV, a fully equipped kitchen (fridge, microwave, washing machine, oven, cutlery, etc.) 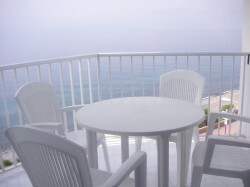 and a spacious terrace where there is a table with chairs for eating directly overlooking the sea. The apartment is located in the seaside town of Almu��car, around 20 km away from Nerja, and 70 km away from Malaga or Granada airports. 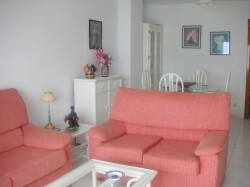 Close by, along a pleasant walk on the seafront, are restaurants, shops, supermarkets and other amenities. 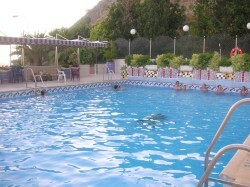 The apartment has well-kept gardens and a beautiful swimming pool with little cascades. The apartment is situated on the fourth floor, and there are lifts and disabled access. Children friendly. Almu��car, founded by Phoenician traders three thousand years ago, lies right at the heart of the Granada coastline, which stretches from the end of Malaga's Costa del Sol until the beginning of the Costa de Almer�a, making Almu��car one of the southern Spain's most attractive stretches of coastline. Recently this area has been named the Costa Tropical because of its unique subtropical microclimate due to the close proximity of the High Sierras, where there is the famous ski resort of Sierra Nevada, and the North African Coast Line. The result is a remarkably good climate with very little rain, and ideal growing conditions for a myriad of subtropical fruits and flowers. Almu��car can claim to have one of the most benign climates of any town in the Western Mediterranean. Almu��car has plenty of amenities, beaches with all different water sports (pedalos, windsurfing, water-skiing, para-skiing, jet-skis, sailing, diving, ) and other sports (tennis, squash, horse riding, golf, hiking, mountaineering, mountain biking, snow skiing, fishing, karting), plenty of restaurants and bars (well known for their delicious free tapas), the famous Venta Luciano, well known for its fabulous flamenco dancers best accompanied with a wonderful dinner or barbecue, an impressive water park with plenty of attractions for the whole family to have a fun day, night clubs, disco pubs, cinemas, shops, a luxurious marina, all different types of markets (fish, flowers and vegetables, antiques, second hand, etc. ), a beautiful Arab old town with the typical Moroccan and Granada handicrafts, a little animal park, an Arab castle, a botanical garden, Phoenician ruins, a Roman aqueduct, museums and much more! Almu��car is ideally located for taking a brief, or not so brief, excursion to some of the most wonderful sights that the south coast of Spain has to offer. Spectacular mountain scenery, unspoilt white towns clinging to the hillsides, unforgettable historic monuments, all within easy reach. There is even Spain's most popular ski resort Sierra Nevada just over an hours drive away. You can laze on the beach in the morning, and in the afternoon visit local villages (Otivar, Jete or Lentej�) or Las Alpujarras, which are a series of mountain foothills that lie between Sierra Nevada and the sea with beautiful valleys and extraordinary snow peaks, or visit Granada, one hours drive away, you can marvel at the eight wonder of the world, the delightful Alhambra Palace, 20 minutes drive away from Almu��car you can also visit the Caves of Nerja and the beautiful white towns of Frigiliana and Salobre�a.